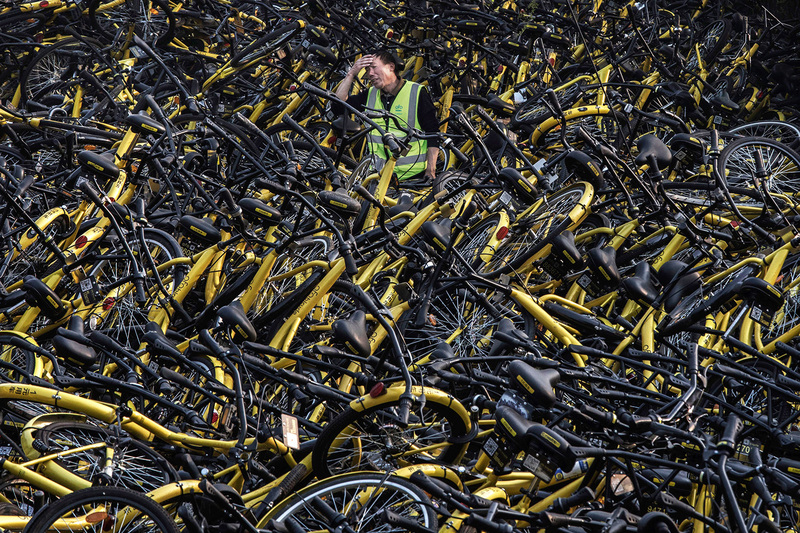 A mechanic from bike share company Ofo stands amongst a pile of thousands of damaged bicycles in need of repair, at a repair depot for the company in Beijing, March 29, 2017. By Liu Qin, a Researcher at chinadialogue, and Zhang Chun, a Senior Researcher at chinadialogue. This article was first published by chinadialogue. Almost one hundred Chinese cities, from Beijing to Lhasa, now have bike-sharing schemes. The bikes, clad in various colors, have GPS trackers and can be unlocked simply by scanning a barcode on the frame with your phone. Some can even be reserved via a phone app. Zhu Dajian, Director of the Sustainable Development and Urbanization Think Tank at Tongji University, told chinadialogue that 10 years of efforts to promote public bicycle schemes by the Chinese government had had little effect, yet these new schemes, run by private firms, have taken off in a mere year and have already reduced the number of car journeys and congestion. Rapid investment has seen the number of bikes on the road skyrocket and spread over the course of the year. But this has also caused problems. Bikes are often parked haphazardly and infringe on urban spaces, while the manufacturing of the bikes is causing pollution. In April, Mobike, known for its red livery and for being the first of the new bike-sharing schemes, worked with the Tsinghua Urban Planning and Design Institute to produce the first report on the impact of bike-sharing schemes. According to that report, the total number of car journeys in the 50 cities in which Mobike operates fell by 3 percent since the scheme launched in 2016 (in Shanghai in April and in Beijing in September). In Beijing, 44 percent of the company’s bikes are used near subway stations; in Shanghai, the figure is 51 percent. Mobike users traveled an incredible 2.5 billion kilometers (1.5 billion miles) in total in one year, saving the equivalent annual emissions of 170,000 cars. These figures were based on Mobike’s user data and 100,000 survey responses. Shortly afterwards, Ofo, Mobike’s biggest competitor (its bikes are yellow) and up-and-comer Bluegogo (its bikes are blue) published their travel data from the first quarter of 2017. As with Mobike, Bluegogo’s report showed a clear drop in short car journeys when its bikes became available. In Beijing, journeys of less than five kilometers (3 miles) fell by 3.8 percent, and in Shanghai by 3.2 percent. In fact, 90 percent of bike-sharing trips are less than five kilometers. The arrival of bike-sharing schemes also saw congestion drop by 7.4 percent in Beijing, and by 4.1 percent and 6.8 percent in Guangzhou and Shenzhen. Contributors to the report included Gaode Maps and research from the China Academy of Transportation Science. Liu Daizhong, China Transport Program Director at the World Resources Institute (WRI), told chinadialogue that although the WRI does not currently have data on bike sharing, the use of these bikes in Chinese cities is already at phenomenal levels. While urban residents may now find getting about the city easier, the rapid expansion has not been without problems. The bikes can be left and collected from anywhere in the city, which is causing headaches for municipal authorities. Media Reports from Shenzhen told of over 10,000 bikes “invading” a beach during a recent public holiday, with an entire road taken over by parked bikes. According to a China Central Television Report, there are currently 20 bike-sharing schemes competing in Beijing, with almost one million bikes. Zhou Zhengyu, head of the city’s transportation commission, said at an event marking Beijing’s Bicycle Day in April that the city has 700,000 shared bikes. It is as yet unknown if this is too many for a population of 20 million, as there are no authoritative figures on how often bikes are used. According to the Beijing Youth Daily, the Xicheng district of Beijing has banned people from leaving shared bikes on 10 major roads. Liu added that citizens have a right to choose how they use the roads, and as more and more people take to shared bikes the model of urban transportation management—currently built around cars—will inevitably change. Zhou Dajiang told chinadialogue that “behind the over-expansion of the various bike-sharing schemes lies excessive competition between companies.” According to one report, Ofo and Mobike have received a number of rounds of funding, with investments of up to three billion yuan. The companies are aiming to snap up market share by rapid expansion. In April, Mobike announced it had put a total of 3.65 million bikes on the road and was manufacturing 100,000 more a day—45 percent of the global total. Ofo says it will have 10 million bikes available by the end of the year. The bicycle is a zero-emission form of transport. But the sharp increase in the manufacturing of bicycles is causing environmental problems. An environmental NGO, the Institute of Public and Environmental Affairs (IPE), has found that some makers of these bikes, such as Fuji-ta, one of Tianjin’s biggest bicycle manufacturers, are getting such large orders from Ofo that they are running at full capacity and failing to take environmental issues into account. Some facilities have failed to upgrade waste gas treatment facilities, or have failed environmental protection checks. The manufacturer of magnesium alloy wheel hubs for Mobike has a poor environmental record—it has directly released dust and toxic substances into the air. Ding Shanshan, head of the IPE’s green supply chains project, told chinadialogue that they have found breaches of rules, such as the construction of factories before approvals have been given. An employee with Flying Pigeon, a well-known Chinese bicycle brand, said that bike-sharing orders mean that production lines are working at full capacity even in traditionally quiet times of the year, with extra staff taken on and output expanded. Monthly output has risen from 100,000 bikes to 400,000. On May 10 and May 26, IPE wrote to two bike-sharing firms, asking them to consider the environmental damage the manufacture of their bikes might be having, to encourage problematic suppliers to make improvements and offer public explanations, and to build supplier management systems. But Ding Shanshan said neither Mobike nor Ofo have responded. A Greenpeace study found that Ofo uses disposable batteries in its smart locks, in order to save money. But this will be harmful for the environment. The Chinese government has already expressed support for the bike-sharing sector. When soliciting opinions on rules for bike-sharing, the Ministry of Transport said that Internet-based bike rental schemes are to be encouraged to develop and improve service levels, so these bikes will help improve urban transportation and reduce emissions from transportation. However, it is still unclear what actual rules will be applied. Zhu Dajian says that the problems arising in the sector cannot be solved by the companies alone and that government, the firms, and consumers need to work together. He says that these schemes, invented in China, have created a new model for the urban public bicycle. Earlier schemes in Europe required bikes to be returned to fixed stations—but the Chinese version is smarter and bikes can be left anywhere. Also, this is a new model for market provision of public services. But he also pointed out that the market is approaching saturation in major cities such as Beijing, Shanghai, Guangzhou, and Shenzhen, the next step will be to limit bike numbers and increase frequency of use. Zhu admits that the government will need a new approach to deal with this phenomenon. But if bike sharing can grow soundly and replace an urban transportation model based around the car, the entire world will benefit from China’s example. China’s bike-sharing firms are already working on international expansion. Ofo has 30 million users across China, Singapore, and the U.S. Mobike says it is at work in over 50 cities in China and abroad, and will cover 100 around the world by the end of the year. The bike-sharing revolution is already breaking out of China’s cities and going global.